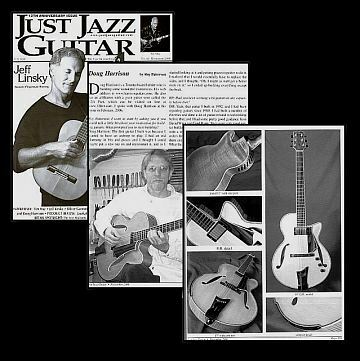 Just Jazz Guitar Magazine is a U.S. based publication that is internationally distributed and features professionally written arrangements you can play - most with tab, standard notation & chord grids, how-to workshops and informative columns, interviews with current jazz greats and guitar legends in the "Where Are They Now?" column, interviews with guitar builders, worldwide CD, book and video reviews. Meet new guitar players from around the world in their "Local Talent" column, read about guitar maintenance with Bob Benedetto, view classic archtop photos and be exposed to 7 string features and music! This particular issue has 200 pages of interviews, reviews and jazz guitar arrangements of classic tunes. It also features an interview that jazz guitarist Roy Patterson did with archtop guitar luthier Douglas Harrison which I have received permission to reprint below! Roy Patterson: I want to start by asking you if you would talk a little bit about your motivation for building guitars. What prompted you to start building? Douglas Harrison: The first guitar I built was because I wanted to have an archtop to play. I had an old Harmony in bits and pieces and I thought I could put a new top on and reconstruct it, and as I started looking at it and getting pieces together to do it, I realized that I would essentially have to replace the sides, and I thought, " I might as well get a better neck on it," so I ended up building everything except the back. RP: Had you been working with guitars in any capacity before that? DH: Yes, that guitar I built in 1992, and I had been repairing guitars since 1980. I had built a number of electrics and done a lot of guitar related woodworking before that, and I had some pretty good guidance from David Wren and Gordon Barry. They were very good guitar builders. They guided me through, and I ended up with a workable guitar, and actually generated some orders from it. People saw it and asked if I could build them one. I was a little dubious at first, but I thought, "What the heck." so I gave it a try. RP: So you started building archtops then in 1992? RP: Did you have any other mentors? DH: No, not really. I had, over the course of a number of years, been taking measurements of all the archtops that passed over my bench that I liked. That allowed me to measure top graduations, and I checked out a lot of different Gibsons, like L-4's and L-5's ... anything that I liked the sound of. I would measure up the bracing and just try to get a sense of what was going on there. I did pick up a blueprint for a D'Angelico that was available from Luthiers Mercantile, I think, and Tom Ribbecke laboriously measured a D'Angelico that he had taken apart to restore, so he had created a blueprint from those measurements, and I used that as a guide for some of the first guitars. RP: Oh, that is interesting. I know Kenny Hill in California, who builds classical guitars, did a lot of investigation into guitars that were built by previous generations of builders. DH: Yes, that is a good teacher if you can get at those instruments. I was fortunate to have them on a fairly regular basis, just working in repairs all the time you see a lot of stuff cross the bench. RP: What was your attraction to archtop guitars? Was it because you were interested in jazz music? DH: That's it. I had been studying jazz since the early '80s. I started taking some private lessons and studying a bit of jazz harmony and learning about that, so that style of guitar has always appealed to me and really has been my first love. RP: I think that is something worth noting. A lot of luthiers, I'm always surprised to find, don't actually play the instrument or they don't play it at any level of accomplishment. Has your ability to play and your study of the music affected your building in any way? DH; I think so. Whenever I play a gig I am using one of my guitars, and so it allows me to field test them. I guess I essentially end up building the guitar that I like the sound of, and that I feel is appropriate for the music I am playing, which is mostly jazz standards. RP: I want to ask you a bit about some technical things. Do you have any particular type of bracing on your archtops? DH: I lean towards X-bracing on all the instruments I have done. I like that sound from listening to the Gibson Johnny Smith guitars and then Bob Benedetto's stuff, and some of the D'Angelicos as well. It just seems to offer a modern archtop sound. It is maybe more balanced ... not quite the initial attack or the power, but the sound is a little sweeter, which I think lends itself to a little more nuance from the instrument. RP: So compared to an A-brace for example, would that be the primary difference? The X-bracing is a little smoother and more even? DH: That's what I find. It has a little warmer sound. RP: Would the A-brace have more punch? DH: Yes, I think it has a little more attack, a little sharper attack. It probably cuts better, but I think it sacrifices a little balance throughout the frequency range. RP: I notice that your finishes have a lot of subtlety. There is a lot of depth there, and the more you look at them, the more depth you see in the wood. Is that something you have really made an effort to develop? DH: Yes, I think I take an unusual approach to the instruments in that I apply the stain directly to the wood. Most luthiers will use a shading lacquer, so they will spray level coats of clear lacquer and then spray a shading finish on top, which gives a nice, uniform appearance if you are doing a tinting, and it is a little less laborious. Finishing direct to the wood accentuates the curl in the maple. If you have even a moderately figured piece of wood it will really stand out, and you are going to have some depth. RP: I understand you've been experimenting with designs that are a little different. Would you talk a bit about that? DH: I'd seen a few instruments that incorporated the side port, and I had an order from a customer to design an instrument with one. The first one I did it on was a blue guitar that I made for a customer who was inspired by Scott Chinery's blue collection. I came up with this series of louvers rather than a single port, thinking it might give it a little more structural integrity. I incorporated a little sliding door internally with slots that lined up with slots in the actual side. When they line up, the port is open, and when the internal door is shifted, the port closes. I was really pleased with the result. I thought that it opened up the sound towards the player without really sacrificing anything going out to the listener. So I subsequently incorporated that on a number of instruments since, sometimes without even using the opening/closing door option, just leaving the port open all the time. RP: Are there any other designs that you have worked with that you thought worked well? DH: Most of the modifications that I am doing to the instruments are fairly small these days. Having gotten a sound that I am pretty content with, I will do smaller adjustments, to see if I can bring a little more mid or a little more low, it is mostly in the nature of top graduations. I did a little shifting in the X-bracing a couple of years back that I was happy with. I also redesigned my 16" model and I'm pleased with the result. I try to get the sound and quality of the 17" out of a slightly smaller guitar. RP: You have recently built some electrics as well. DH: That's right. I've worked with Gary Benson, who is a wonderful player, and he had some ideas that he wanted to incorporate in a semi-hollow guitar, so we put our heads together on some of the dimensions and I put out a prototype for him, which he used for a number of years and quite enjoyed. I made him a second model with a few little refinements ... a little bit lighter weight, more chambering to the body, and all those I have made subsequently have been hollowed out. It is a 14.25" guitar with about a 2" chambered body, mahogany or maple, with a carved spruce top. RP: By chambered, do you mean carved out of a solid piece of wood? DH: Right. The top and back are still book-matched but the top is carved much like a conventional archtop, except there is no bracing, and it meets up with a block in the back, just under the bridge. That gives it some of the archtop characteristic but with very good feedback rejection. RP: Do you have different feelings about different pieces of wood? DH: I really have grown to like using Sitka spruce for tops. It is one of my favorites. I have used others with good results, but I keep coming back to the Sitka because it seems to have a nice warmth. It is very easy to get the kind of sound that I am after when I use that. The other material that I like, for backs and sides, is Big Leaf maple. It can be a gorgeous wood with a very deep flame. It also has a nice medium density that is reasonably good to carve. I love the deeply curled wood, but at the same time it is much more challenging to work because it tears up with the power tools and your hand tools have to be kept absolutely sharp or else they will just tear it up when you try to cut it. RP: Sitka spruce is native of where? DH: North America. Generally, west coast: Washington State into Vancouver and Alaska. RP: Is there another name for that tree? DH: It is Picea Sitchensis. It's what they used when they built the "Spruce Goose" for Howard Hughes, it was used a lot in the early airplanes because of its stiffness-to-weight ratio. RP: Are there things about the process of lutherie that you feel foster a sustained career? Are there things that you feel you will be perfecting forever? DH: I think so. I am always challenged by customer requests ... things that I may not have undertaken on my own, like doing the side port. It is not something that I would necessarily have attempted, but because someone was interested in it, I was able to do it under the auspices of an order and he had faith that I would come up with something workable. . Often, customers request finishes or cosmetic things. I did a 17" not too long ago that incorporated an armrest, which was a different challenge and it also had a fairly elaborate abalone perimeter. To cover both of those aspects, the armrest and the inlay, and make it all look right was a challenge. I enjoy meeting those. RP: Are most of your clients professional players or do you have collectors who order your instruments as well? DH: It's a mix. I think a number of the buyers are serious guitar players who are not necessarily professionals ... people in the business world, doctors, lawyers etc. who are very serious about the instrument. Some of these guys can play very well. Rather than golfing or whatever hobby, they are pursuing the study of jazz guitar. RP: All right, well, thanks a lot for the time. Keep building great instruments and hopefully we will see more of them out there on the bandstand!